When it comes to kitchen convenience, it’s hard to beat a microwave. Whether you’re whipping up a curry in a hurry or defrosting dinner, it’s hard to imagine life without a microwave to speed things along. Our collection of Sharp microwaves showcases the latest microwave technology, adding even more convenience and functionality and delivering better results with less hassle. Take the R760SLM Microwave with Grill, a Sharp microwave that utilises a flatbed design, so your cooking isn’t restricted by the traditional turntable design. Because it isn’t limited by a turntable, the R760SLM makes it easier to cook with different-sized dishes, giving you 23 litres of room, and significantly expanding your mealtime options. Alongside an array of handy functions that ensure it’s easy to start cooking a variety of different meals and ingredients at the touch of a button, the R760SLM comes equipped with a built-in grill, giving you an invaluable addition to your kitchen. Even if you’ve already got a grill, you’ll find this powerful, seamlessly integrated grill will come in handy for all sorts of everyday cooking. Whether you’re preparing a quick grilled cheese snack or cooking chicken, meat or fish, it delivers evenly cooked results with the minimum of effort. 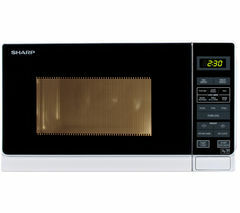 Our collection of Sharp microwaves spans a wide range of price points, allowing you to find a model that suits your needs and budget. Whichever model you choose you can be sure it will enhance your day-to-day cooking, bringing effortless, time-saving functionality to your kitchen. 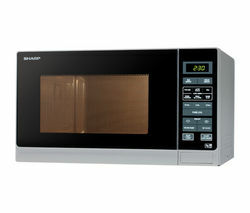 Check out our complete microwave range to browse the latest models from all the leading brands. Alongside an extensive selection of Panasonic microwaves our collection includes Russell Hobbs, AEG, Bosch and Samsung microwaves.